Big trouts like tasty meal. So what to serve them to get the ultimate attention? This Magic Minnow Miny Goby lure works very, very well. Watch the action and see the difference. Kinetic Fishing is really good at designing this type of lures for big trout. What is 'fish in Filipino"? and what is fish in Esperanto? How Turks say "Fish"? 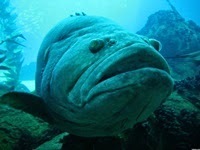 Goliath Grouper - What Do You Know About Goliath Grouper? One of the most legendary fishes of the seas, The Goliath Grouper. Where do they live, how do they live, how they behave under the water. This is an amazing documentary about Goliath Grouper. 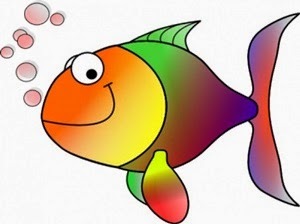 After nearly becoming extinct, the fish was afforded legal protection enacted in 1990. Twenty years later, the protection is finally starting to pay off. Divers and underwater photographers visit a shipwreck in Florida where Goliath Groupers gather to spawn every year. These massive animals are so beautiful. Let's watch! Usually we catch the fish and land it onto our boot, or shore or into our bags.. Well. "usually".. But sometimes fish might attack back. As you gonna see in this video. If you are madly in love with fly fishing and if you have never been to Slovenia; believe me, you haven't lived yet! Slovenia has some of the most productive rivers of Europe. You can find there incredibly clean waters where wild brown trout and rare marble trout live. These guys are on action in Soca River. Aren't they so lucky? We thank them for sharing this beauty with us. Look at the colour of the water. Isn't it so seductive? Magnificent mountains, green forests, blue sky and gorgeous nature.. A true paradise for fly fishing fans. We all love bass fishing. Bass is a very exciting fish so it makes us get very excited, too. This guy gives us tips about finding the bass in the lake. Simple and clear tips. Lets catch some bass now! World Fly Fishing Championship 2013 - Highlight from the 2013 World Championship Fly Fishing tournament. Introducing teams, locations, lodges and some new competitors. Fantastic photos, amazing landscape, beautiful clear waters and wild trout everywhere.. Highlights from the 2013 World Championship Fly Fishing tournament. I know, its a dream fishing scenario for almost every amateur; travelling to Caribbean, finding a paradise-like sandy beach and casting for big game fishes. Bonefish, Tarpon, Barracuda and others. These lucky guys are doing exactly what we dream about. Fly fishing in Cuba! must be an amazing adrenaline explosion. 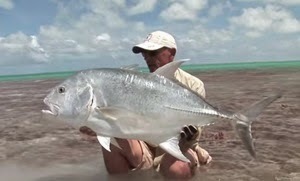 Saltwater fly fishing has a different taste. 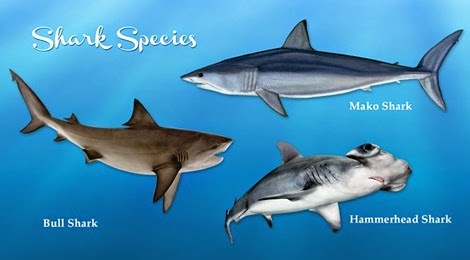 Saltwater creatures behave different. 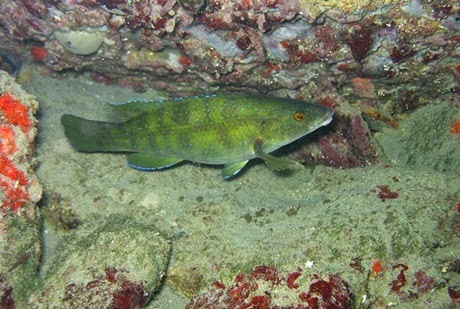 I have caught one Brown wrasse near Mersin, Turkey. I didn't eat it, so I don't know how it tastes like. I released it back into blue waters and watched it under the sea. It immediately went under a big rock and then jumped into weeds that cover the rocks. Fishing in the West -usually- means lots of high tech gear, equipment, expensive rods, fishing lines, laser cut hooks, biological baits etc.. But in the other parts of the world, there are lots of fishermen still fishing in traditional way and they really are very good at it. Watch these guys, fishing in the Philippines, as usual, simple and easy. Have you ever heard a fish called "Talakitok" ? Fishermen of Samar Island (Central central Philippines) call trevally "Talakitok". If you join a fishing trip in Samar Island, you will definitely catch one of these beautiful trevallies. Swordishing is very difficult and sophisticated. It requests a lot of attention and passion. Therefore you need to know what you are doing. You just can't throw your bait into sea and wait, Swordfish is not just a fish; its a very, very clever predator. Swordfish loves squid (well, which fish doesn't?) if you know how to present it, you will definitely attract that big one. In this how to do video Captain Smith teaches an easy and fast method for rigging a squid for swordfish. As I always say, if you know where when and how to fish, luck will always be with you..
Have a look at these guys. A perfect fishing spot in Alabama. Basses are in the water. A hot day. So quiet indeed and irresistible fly on the rod. Lucky brothers in low. Enjoying Alabama's beautiful creeks for spotted bass. Siberia is wild so it's fishes. This native Siberian fisherman catches an enormous salmon in one of those unpolluted Siberian rivers. Look at this gorgeous salmon; Who wouldn't like to catch something like this? Imagine it on your rod.. your fishing line would make good sound, eh? This how they catch Cod at Norfolk coast, England. See how he puts the bait (worms) on hook and prepare his rod.